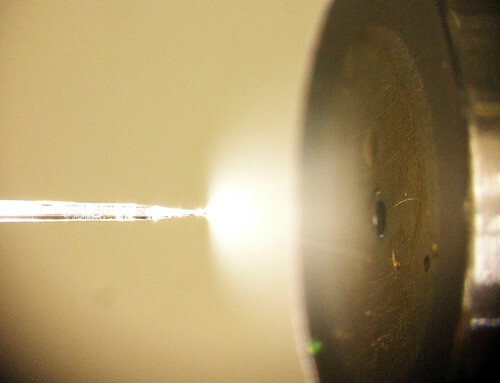 A PNNL-developed method to manufacture emitters for mass spectrometry allows emitters like the one shown here to spray aerosols at extremely low, controlled rates without clogging. This allows more of a sample to be analyzed by the mass spectrometer, which helps scientists learn more about the molecules they study. PNNL scientists developed a new way to manufacture tiny glass tubes called emitters for mass spectrometry. The method produces an emitter, shown here, more consistently and reliably. RICHLAND, Wash. — The Department of Energy's Pacific Northwest National Laboratory is being recognized for bringing a lab-developed technology that improves research sample analysis to the marketplace. The Federal Laboratory Consortium announced today that PNNL is receiving a 2012 Excellence in Technology Transfer award. The consortium is a nationwide network that encourages federal laboratories to transfer lab-developed technologies to commercial markets. PNNL has been honored by the FLC more than any other federal laboratory with this award, collecting 75 awards since the program began in 1984. The award will be presented May 3 at the consortium's annual meeting in Pittsburgh, Penn. Scientists can better understand larger biological molecules such as proteins with the help of a tiny glass tube, called an emitter, that's used in electrospray ionization mass spectrometry. PNNL scientists developed a new way to manufacture emitters that is being used by Michrom Bioresources, Inc. of Auburn, Calif. Mass spectrometer instruments equipped with the improved emitters can advance research related to human health, the environment, petrochemicals, drug development and more. Electrospray ionization mass spectrometry examines macromolecules and other chemicals of interest by mixing them in a liquid and using an electrically charged emitter to turn the liquid sample into charged particles that are directed into a mass spectrometer. Traditionally, the tapered ends of emitters are made by heating a glass capillary and pulling until the end forms a fine tip. But this method can also make the capillary's narrow opening — which is as wide as a horse hair — even smaller at the tip. This often causes particles to get stuck in the tip, which produces unreliable readings and costly instrument downtime. 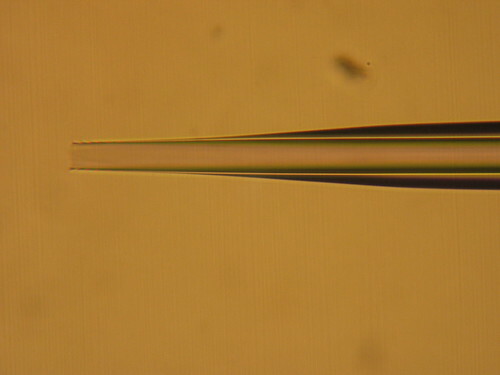 PNNL's process forms the tapered end by etching capillary tubes in a hydrofluoric acid solution. The method consistently creates an external taper without changing the capillary's internal diameter, which allows emitters to spray aerosols at extremely low, controlled rates without clogging. This enables more of the sample to be analyzed by the mass spectrometer, which helps scientists learn more about the molecules they study. PNNL licensed the patents behind the technique to Michrom in a matter of months after helping the company evaluate the new tips. Michrom began selling the new emitters as part of its CaptiveSprayTM ion source in October 2010. Six months later, Michrom was acquired by Bruker Corporation, which could expand opportunities for the technology's use. More information about PNNL innovations available for license can be found online at http://availabletechnologies.pnl.gov/default.aspx. Business inquiries can be directed to 1-888-375-PNNL or techcomm@pnl.gov.